by Shantena Sabbadini and Cruz Mañas. 8th October 2017, Bolonia, Italia. 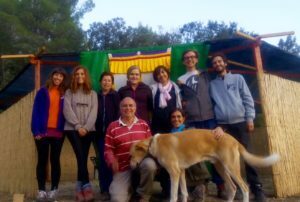 Autumn 2016, at Sangchen Norbu Ling, Teruel. Spain. With Cruz Mañas and Ngawang Wangjor, Buddish Master of Sakya Tibetan School. Founder of International retreat center Sangchen Norbu Ling, at Monroyo, Teruel. Master of Tibetan Shi Ne Reiki. Gestalt therapist. “Sobre la Tierra, desde el árbol, la rama, un fruto, en mis dedos su piel es la mía.